I've received a number of reports recently from landscape managers and arborists of thin cylindrical strands of white sawdust appearing to creep out of small holes in the trunks of recently planted trees. These delicate, odd looking structures are the calling card of Ambrosia Beetles and are sometimes called "frass toothpicks." They also indicate trees are in serious, irreversible trouble. The name "ambrosia beetle" is given to beetles that have a symbiotic relationship with so-called "ambrosia fungi." Female beetles bore through the bark, the phloem, and straight into the xylem where they tunnel to create galleries in which they lay eggs. As they tunnel, they release fungal spores. The resulting fungus colonizes and digests wood. Ambrosia beetle larvae do not eat wood; they eat the fungal "ambrosia" that grows from the walls of the tunneled galleries. In other words, the larvae don't need to extract nutrients directly from tough "lumber;" they let the fungi do the work. The image below shows the ambrosia fungus appearing as a white rind-like growth lining the walls of the galleries. As female beetles bore into xylem, they push a mixture of excrement (frass) and wood particles backwards out of their entrance holes. The sticky mixture clings together as it is extruded and has been commonly described as looking like "frass toothpicks". Worldwide, there are over 3,000 species of beetles that practice this fungal cultivation strategy to feed their young. They belong to two subfamilies, Scolytinae or Platypodinae. However, the ambrosia beetle moniker is not associated with beetle taxonomy; the name is attached to the beetle's fungal-farming life-style. It's a good example of convergent evolution with many species of beetles arriving independently at the same successful survival strategy. There are a number of native and non-native ambrosia beetles found in Ohio. The non-natives are dominated by the Granulate Ambrosia Beetle (Xylosandrus crassiusculus) and the Black Stem Borer (Xylosandrus germanus). These beetles share some common traits with our natives. 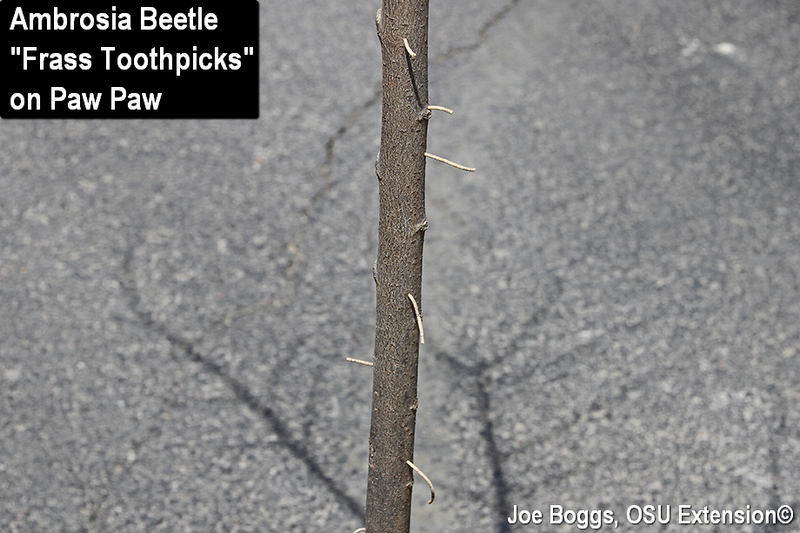 Ambrosia beetles in Ohio do not attack healthy trees; they select trees that that are unable to mount a defense. Indeed, researchers with the USDA-ARS Hort Insects Lab in Wooster, OH, showed that trees that were stressed by too much water emitted ethanol, a well-known ambrosia beetle attractant. It's like an "eat here" sign to the beetles. Unfortunately, ambrosia beetles tend to attack trees en masse which means halting the onslaught once trees become festooned with frass toothpicks is for all practical purposes impossible. That's because stress-related conditions that made the tree susceptible in the first place may by themselves kill the tree. For example, I looked at a small paw paw tree (Asimina triloba) earlier this week that was sprouting frass toothpicks. It had been planted for around a month prior to the beetle attack and the alcoholic scent wafting from darkened wood was eau de food to the beetles. The tree was clearly dead perhaps due to over-watering or some other stress-inducing problem. The bottom line was that the beetles were an after-the-fact issue; they did not kill the tree but were simply taking advantage of free food. This means tree health management is ambrosia beetle management. The most important step in thwarting a beetle attack is to solve or prevent tree stress issues, particularly on newly planted trees, such as poor planting site preparation, improper installation, and poor after-planting watering practices. This will lesson so-called "transplant shock" which is known to make newly planted trees susceptible to attack. Heavily infested trees should be removed and destroyed and newly planted trees located nearby protected with bark applications of insecticides formulated as long-residual borer sprays, such as Onyx (bifenthrin) or Astro (permethrin). Depending upon the species, it is not unusual for ambrosia beetle activity to peak in the spring, subside for a few months, then rise again in late summer to early fall. Thus, where ambrosia beetle populations are heavy, applications must be made to trunks and branches throughout much of the growing season at intervals specified by directions on the product labels. Ambrosia beetles and bark beetles are very small, measuring only 1/8 - 2/8" long, and they produce tiny shot-sized holes in the bark. In fact, old ambrosia beetle holes may be mistaken for those produced by bark beetles. However, the hole-making behavior and larval feeding activity of bark beetles is very different from ambrosia beetles. Ambrosia beetles bore into the xylem; bark beetles confine their tunneling to the phloem, both as adults and larvae. Bark beetle adult females make holes through the bark on their way into trees, then they tunnel through the phloem parallel to the xylem as they feed and lay eggs. Their larvae also confine their tunneling and feeding activity to the phloem with some slight etching of the outer layer of xylem. New adults make new holes through the bark as they emerge. New ambrosia beetle adults emerge from deep within the xylem through the holes that were created by the parent females. Thus, ambrosia beetles produce fewer holes and their holes can be separated from those produced by bark beetles by inserting a bent paper clip to measure hole depth or by removing bark to reveal that holes extend into the xylem.